Sepia photo for print (14.7" x 9.7" sepia jpg, 7.2 MB). Ancient Future circa 1990. Photo by Irene Young. Pictured: Matthew Montfort (guitars), Jim Hurley (violin), Doug McKeehan (keys), Ian Dogole (percussion). On June 7, 2011, the exact lineup of Ancient Future that performed on the band's influential World Without Walls and Asian Fusion recordings will reunite to perform for the first time in over 15 years at Yoshi's San Francisco and other venues. To celebrate the reunion concerts, Ancient Future's classic 1990 World Without Walls recording is scheduled to be released by Capitol/EMI Records for the first time ever at major digital retailers such as iTunes and Amazon.com MP3 Store on June 7, 2011. As its name suggests, World Without Walls by Ancient Future depicts a musical world without borders. 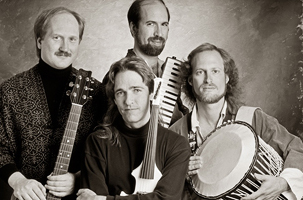 This classic 1990 recording features Ancient Future members Matthew Montfort (scalloped fretboard guitar, steel string guitars, electric guitars, classical guitar, guitar synthesizers, mandolin), Jim Hurley (acoustic violins, Zeta electric violin, steel string guitar), Doug McKeehan (piano, synthesizers), and Ian Dogole (dumbek, talking drum, congas, bongos, udu, shaker, bass drums, cymbal, sleigh bells, kendang, kajar, ceng-ceng, bells, chimes). 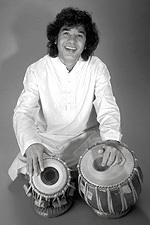 The record also features guest performances by world music legend and tabla master Zakir Hussain (tabla, kanjira), Gary Brown (fretless electric bass), Jeff Narell (steel drums), Vince Delgado (tambourine), Jack Dorsey (drum set), Bill Douglass (acoustic bass, Chinese flutes), and Bruce Kaphan (recording engineer, shaker). The inviting melodies and ingenious use of ethnic textures make World Without Walls one of Ancient Future's most accessible and broadly appealing releases ever. BILLBOARD calls the group "trendsetters" for contributing to the emerging movement known as world fusion music, a term Ancient Future leader Matthew Montfort coined at the bands inception for music that blends musical ideas from many different cultures. Formed in 1978, Ancient Future is the world's first and longest running ensemble dedicated exclusively to the mission of the creation of world fusion music. Their original music is an exhilarating fusion of exciting rhythms and sounds from around the globe that combines contemporary jazz and rock with the irresistible rhythms of African, Balinese, Indian, Middle Eastern and South American percussion, the rich harmonies of Europe, and the beautiful melodies of Asia. 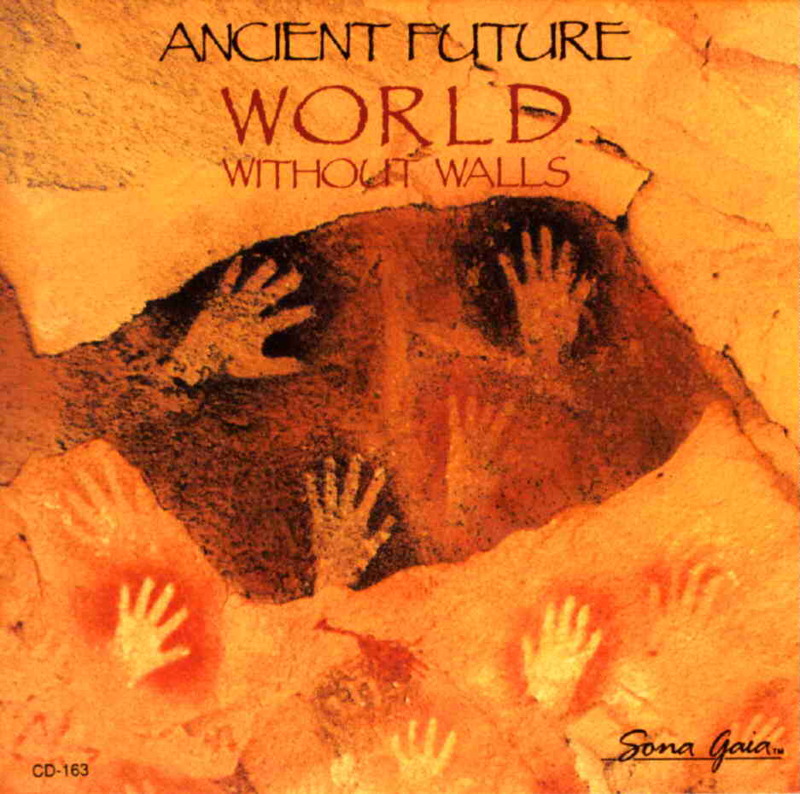 In the years since the initial CD release of World Without Walls, Ancient Future has expanded from its core lineup through collaborations with noted masters of various world music traditions who are now an integral part of what is today more than just a band. Ancient Future has grown to become a large chamber ensemble of more than thirty performers from around the world with over a dozen smaller ensembles within it, enabling Ancient Future to realize its core mission of creating world fusion music. Lakshmi Rocks Me (Jim Hurley. 2:52). Sample MP3 (excerpt) (992K). >YTmusic. Dance of the Rain Forest (Matthew Montfort. 4:45). April Air (Doug McKeehan. 3:57). 14 Steps (Matthew Montfort. 4:30). Sample MP3 (excerpt) (1MB). >YTmusic. End of the Beginning (Matthew Montfort. 5:15). Turkish Taffy (Doug McKeehan. 4:55). Indra's Net (Jim Hurley. 4:53). Nyo Nyo Gde (Matthew Montfort. 4:00). Gopi Song (Doug McKeehan. 7:46).